Good night, sweet prince. You were always so kind to me. I’ll try to remember you, and I’ll try not to judge your little brother, Masters 25, by your standards. Oh, who am I kidding? Cube is great. We want more Cube! Down with the tyranny of “real” sets! This edition of Legacy Cube was particularly kind to me. Coming into this week, I was 20-7, which is a fantastic win-rate on MTGO. I was definitely sad to see it go, but all good things must end. Did I close things out on a high note? This deck had some real quick potential kills off of Entomb, but not a whole lot of interaction. Daze was my only reactive protection for the combo. I did have a reasonable suite of proactive disruption in the form of Inquisition of Kozilek, Collective Brutality, and Vendilion Clique, and Gitaxian Probe at least let me know when the coast was clear. I had to be very aggressive with my combo, though, as I had no way to really win a long game. Round 1, I had the pleasure of running the ol’ turn-1 no plays line again, and a turn-2 Sundering Titan was able to close, even through my opponent killing it once, as I had the Animate Dead to bring it back. In game 2, I set up to reanimate a Griselbrand via Buried Alive, but my opponent cast Hymn to Tourach, which hit my Exhume, and I couldn’t muster anything quickly enough to come back. Game 3, I hymned them right back. Unfortunately, this hit their reanimator target (which I had not seen in games 1 or 2!) and a Living Death put it away for them. Round 2, I had Entomb into Reanimate on Griselbrand. My opponent had Cyclonic Rift to delay their demise a bit. But I just drew seven in response, discarded the Griselbrand again on cleanup, and had another reanimation effect on turn 3. Game 2, I whiffed on my turn-3 Inquisition of Kozilek, but that was because they were holding Jace, the Mind Sculptor, Emrakul, the Aeons Torn, and lands. They drew out of it well, but Baleful Strix eventually put Jace down (they never plussed, for some reason…), and I hit Mirari’s Wake off of Gonti, Lord of Luxury that let me hard-cast a Griselbrand, which I rode to victory. Round 3 showed it was just not my draft. My opponent led on Swamp, Swamp. I cast Buried Alive. They cast Animate Dead on my Griselbrand. I conceded. Game 2, I Entombed into a Reanimated Griselbrand. They conceded. Game 3, they mulled to 4. I kept a hand with Search for Azcanta, Daze, and Griselbrand. Surely Search will find me gas. I wound up spending Daze on their turn-3 Buried Alive, figuring that the only way I lose to a mull to 4 is if they go off with Griselbrand, and I wasn’t likely to be able to Daze a cheap reanimation spell. Naturally, I died 3 turns later to a turn-4 Phyrexian Obliterator off the mull to 4, followed up by a Gray Merchant of Asphodel. Sometimes it just ain’t your day. This was a really interesting draft. My first three picks were Snapcaster Mage, Venser, Shaper Savant, and Underground Sea! I followed up with Mana Confluence, Sword of Fire and Ice, and Spell Queller, picking up Chandra, Torch of Defiance and Geist of Saint Traft and an absurdly late 8th-pick Lightning Bolt later in the pack. Notice how many of those cards wound up in my deck at the end? Three, if you count Mana Confluence, which I do, since it was basically the deck’s MVP alongside Inspiring Vantage. 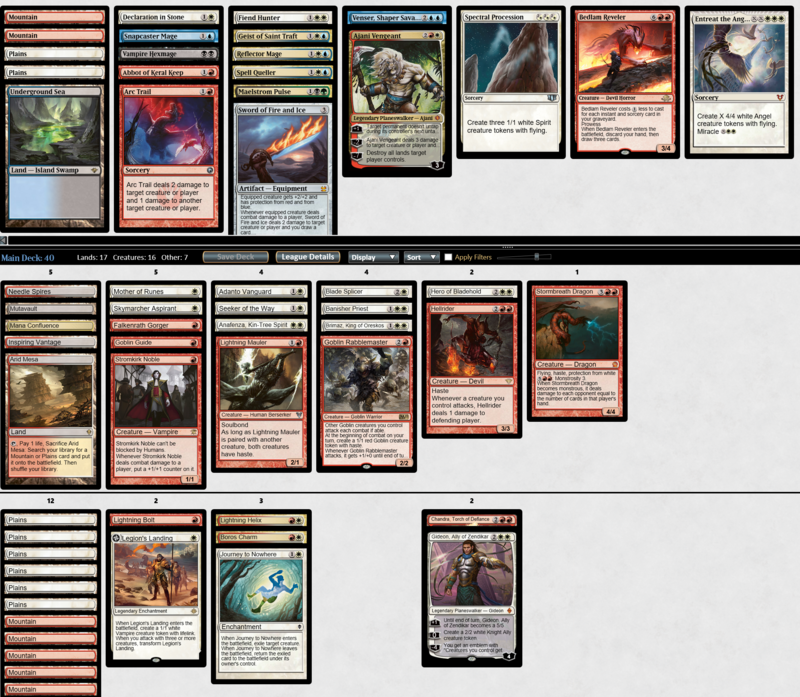 After pack 1, I thought I would probably wind up some weird UW tempo-style deck, perhaps splashing red. On the wheel, I had gotten, Journey to Nowhere, Reflector Mage, and Seeker of the Way. I had a notion that red, particularly red aggro, was wide open, on account of that Lightning Bolt going 8th. That meant that nobody else at the table had wanted it. While it was possible that some red aggro player took something like Hellrider or Goblin Guide over it, I think it’s a major sign that red is there if you want it. Pack 2, I opened on Gideon, Ally of Zendikar, which is one of the more powerful cards for the other good aggressive color, white. Some RW duals and a FOURTEENTH-PICK Hellrider later, and I was locked into RW. I don’t like this position, normally. Aggro decks tend to be quite demanding on colored mana requirements, since all of their cards are cheap, and you want to be playing multiple spells on fewer lands. If you’re going to play aggro, it’s usually best to stick to a single color. This deck’s raw power is insane. It has some of the best 4-drops in the whole cube, plus the lower drops to back them up. This might just be the best deck in the cube, if you have the mana for it. Honestly, I wasn’t too thrilled by that part of things. Yes, I have four duals that help, but one of them is Arid Mesa, which doesn’t actually tap for both red and white without Sacred Foundry or Plateau. Needle Spires is great against control decks, but it enters tapped and won’t help me play my million one-drops. Playing Mutavault was insanely greedy and probably wrong. It probably should have been another colored source, but I am lucky enough that it didn’t punish me. Round 1, I got paired against a UB player running Ancient Tomb. They did deploy a turn-5 Wurmcoil Engine in the face of my Goblin Rabblemaster, which let them gain 6. Didn’t matter. This party don’t stop. I managed to attack for enough that my Stormbreath Dragon finished the job. Game 2, they had a similar plan, but this time I had Journey to Nowhere to clean up the Wurmcoil with a little less sweat. As a note, I had the option between Banisher Priest and the Journey. Banisher Priest would develop my board more, and it was also a much more efficient use of my mana, particularly my colored mana. However, I was playing against a tapped-out UB opponent. They have very few ways to remove Journey to Nowhere, and a lot more ways to remove a Banisher Priest. If they were able to kill the Priest after I attacked, that would be curtains for me, as the Wurmcoil would come back and get to eat a creature (and gain them 6 life) before I could remove it again. It was much safer (and correct, IMO) to take the tempo hit and play Journey to Nowhere against an opponent about to be at 10 life, who has an Ancient Tomb in play. Round 3, I mulled on the draw, but it turns out that Jace, Vryn’s Prodigy is a Human, which has a bit of trouble blocking Stromkirk Noble, despite my opponent trying several times. They fought back with the flipped Jace finding and recasting a sweeper, but they were too low, and a Needle Spires activation ultimately did them in. Game 2, they again had the turn-2 Jace, looting away Sheoldred, Whispering One and Angel of Serenity, which had me quaking in my boots a little. Evidently they never found a way to reanimate them, as I hit the Jace with a burn spell and ran roughshod over them to the trophy. Ahh, back to my roots. 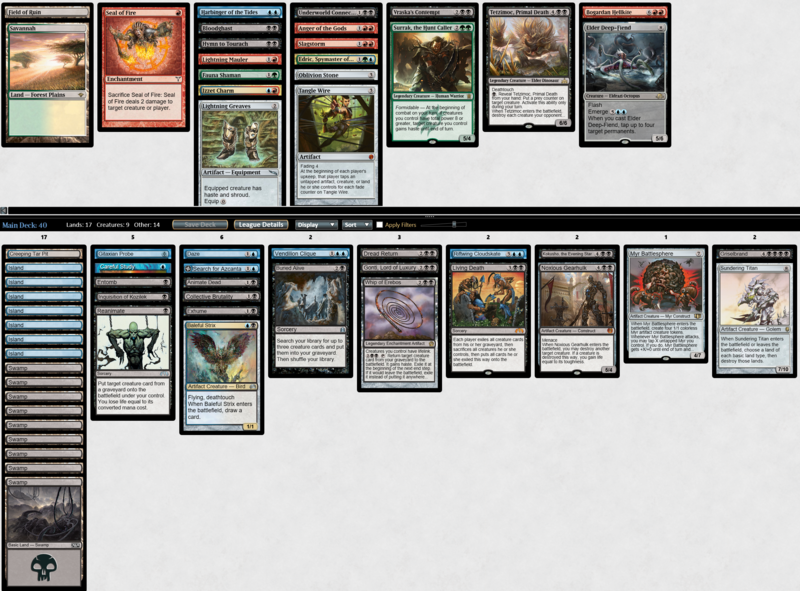 This draft started off on Consecrated Sphinx, and I never looked back. I had the Gifts Ungiven + Unburial Rites combo, but nothing quite big enough to make it worth playing. My mana wasn’t the best, but Dragonlord Ojutai is a strong enough card that it’s worth splashing, in my opinion. It’s exactly the kind of finisher the control deck wants. Round 1, I played against Grixis reanimator. I opened on a turn-1 Ancestral Vision. They blew their Force Spike on my Baleful Strix, which allowed me to resolve Phyrexian Arena, which put me ahead on cards. I was looking like I was about to lose when they dumped Griselbrand into the ‘yard, but they targeted Elesh Norn, Grand Cenobite with their Dread Return. They were at 16. I was at 9, and they had a 1/3 in play, so they got to attack me down to 6, but…Griselbrand would have buried me in card advantage. As it was, I calmly untapped, smoked the Elesh Norn with my Noxious Gearhulk and took the game. I must have tilted them, because they straight-up conceded when I resolved a Vendilion Clique on my own end step. They had tapped out to Electrolyze my face. I resolved Clique, took their Izzet Charm and left them stranded with a hand full of bombs and no way to get them into the ‘yard. They scooped after drawing for the turn. Round 2, my opponent got stuck on lands, but did have the Animate Dead for my Noxious Gearhulk, killing my Gonti, Lord of Luxury. Unfortunately for them, Gonti had dug up a Desecration Demon, which I rode to victory. I love Gonti. Game 2, Gonti hit Dragonlord Silumgar, which stole their Liliana, Death’s Majesty, and that was all she wrote. I love Gonti. Round 3 was a strange one. In the first game, my opponent resolved Sword of Body and Mind. I was not pleased. I did manage to string together enough black removal to not die to it, however, and took game 1. I sideboarded for a blue-white tempo-creature type matchup because that’s what I had seen from them. In game 2, they had Sword of Light and Shadow to go with their other sword. On one critical turn, I tapped low to kill two of their things and promptly got met with an Ugin, the Spirit Dragon, which destroyed me. Not what I had expected out of a deck packing a pair of Swords, but hey, sometimes that happens. Game 3, they ground me down with Sun Titan, forced me once again to tap out, and Ugin’d me. The following turn, they bolted me with Ugin down to 3, made some tokens with Elspeth, Sun’s Champion, and I that actually almost gave me an out. I had previously stuck a Liliana Vess. I was able to tutor for Massacre Wurm, cast Jace, the Mind Sculptor, draw the Wurm, and play it. This would deal them 6 damage from their tokens dying, and I had a Gonti that would knock them to 2. Not quite there, and I was at 3. All they had to do was plus Ugin. I honestly don’t know what happened here. They had a little over 2 minutes on their clock. I activated Liliana to tutor, then put Jace on the stack. I knew I was dead, but I thought hey, might as well play it out. Jace never resolved. They timed out while he was on the stack. If their internet went out, they picked a hell of a time for it, since all they had to do was F6 and win on their turn. I never got any messages about them disconnecting, and they never said anything about having to leave. I like to think that I bluffed them into thinking I actually had outs, and my convoluted way of drawing said outs put them on such tilt that they walked away. Or something. In reality, they probably did disconnect, or something important came up. Lucky for me, we live in 2018, and I’m free to make up whatever narrative I want. Anybody who says I lost that match is FAKE NEWS. So it goes that I end this edition of Cube with a 75% winrate. I can’t recall a format where I’ve done that well. Of course, this is a pretty small sample size in the grand scheme of things, but five trophies in twelve drafts means I’ve got to be doing something right. What is that something? 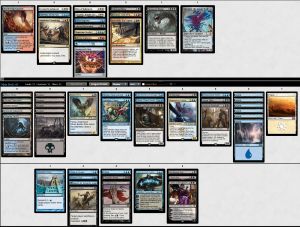 Well, I really drafted two primary decks: blue-black reanimator and white aggro. While I did score trophies with WR aggro and 4-color control, the majority of my good drafts fell into the other two archetypes. I only drafted green a couple times, and one of those was one of my pair of 1-2 finishes. Green never felt open, to me, except when it was far too late. I never saw Rofellos if I didn’t open it, and the only time I saw Natural Order get passed was the tail end of pack 3. I think people really over-draft green, in part because that’s what you’re supposed to do in cube, right? Take fast mana! Except I didn’t find it to be that scary. I played against a disproportionate number of green decks, or at least it seemed that way, but they didn’t have the threat density you need, most of the time. I touched on this last week, but I’ll reiterate here. I think that this shortfall actually happens because we are in Legacy Cube, not Vintage Cube. In Vintage Cube, you probably only have one green drafter at a table, since fast mana is available to everybody. In Legacy Cube, your fast mana is limited to a single color or a very small set of artifacts like Coalition Relic. And what is every first-time cuber taught? This ain’t your grandma’s draft format! People are gonna be killing you fast! You have to be faster! Take fast mana! So everyone does. And because it’s Legacy Cube, they all wind up green. They all fight over the big green creature payoffs like Craterhoof Behemoth and Avenger of Zendikar. Then, at the end of the draft, they have a few mediocre mana dorks, but very little in the way of actual threats. If you can deal with the few they can find, they just don’t have the teeth left to beat you. I also found reactive counterspell-leaning decks to be pretty bad. For one, we’ve got things like Remove Soul instead of better counters like Mana Leak. It feels real bad to be holding a Remove Soul in the face of a Gideon or some other impactful planeswalker. When I play control in this format, I want proactive disruption and tap-out threats. Thoughtseize, Vendilion Clique, Supreme Verdict. Those type of things. I just want to slam planeswalkers and win that way, rather than playing draw-go. I’ve seen cubes where draw-go works, but I generally did not have much success going that route. That’s why Gonti is so high, in my opinion. They block well and provide sometimes insane amounts of value by stealing a large threat from your opponent. I like having access to some countermagic in my control decks, but I won’t build around it. Forbid is a great one to have, as it lets you turn anything into more counterspells if that’s where you want the game to go. The drawback isn’t as impactful in such high-powered formats, since you have powerful draw engines of your own, and the things you are countering often involve large investments of resources from your opponents as well. Not that any of that is going to stop me from slamming Cryptic Command every time I see it. Just something to keep in mind for the next time cube rolls around. There will be changes, of course, but the previous state of the format is definitely something to keep in mind when looking at the changes in context! Next week I’ll dive into some Masters 25. I’ve already done a draft and a half, but I figured I’d save those for next week to make these articles a little more cohesive.